First of all, prepare your local environment for the use of Vagrant and Oracle VirtualBox, if you have not already done so. 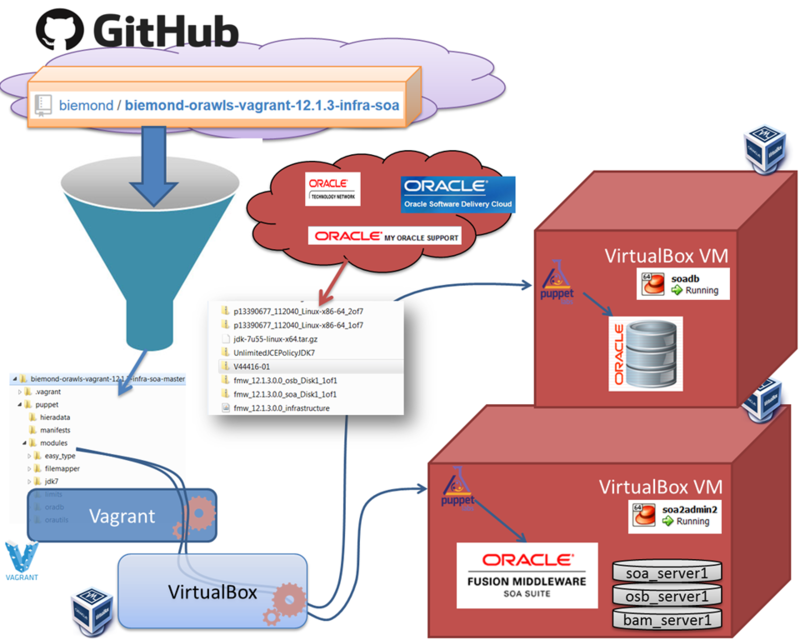 The required actions are described in this article –Fastest way to a Virtual Machine with JDeveloper 12.1.3 and Oracle Database XE 11gR2 – on Ubuntu Linux 64 bit – under steps 1 through 4. 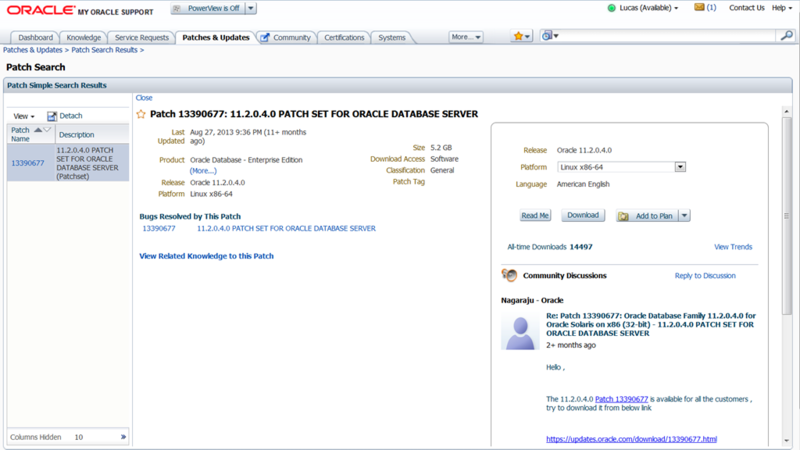 The specific database software for 11.2.0.4 can only be downloaded from Oracle Support at this time. Go to https://support.oracle.com and search for patch 13390677 (also see instructions in this article: http://www.snapdba.com/2014/01/oracle-database-11gr2-11-2-0-4-installation-on-oracle-linux-6-4/). Download the software for Linux x86-64. make sure you download the JDK for Linux x86-64 (the guest OS) and use the JDK 1.7u55 jdk-7u55-linux-x64.tar.gz file. 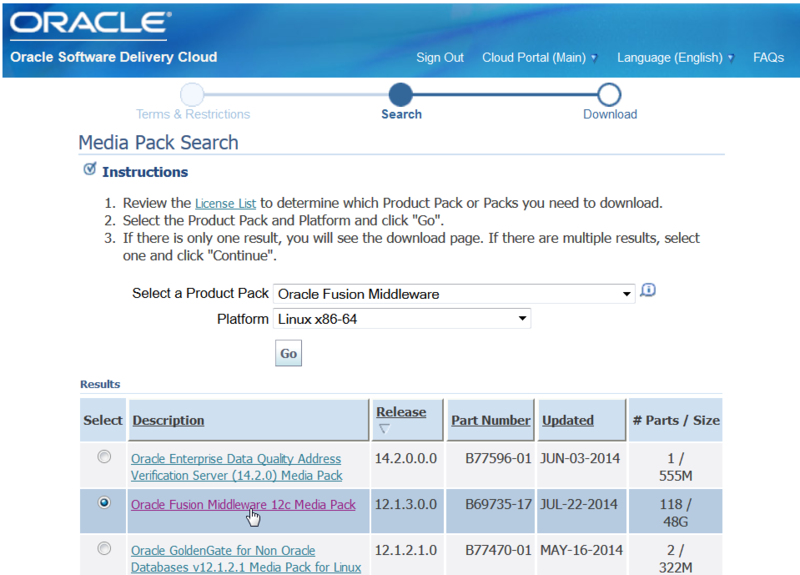 The required files for Fusion Middleware are available from the eDelivery cloud at Oracle: https://edelivery.oracle.com. After downloading, extract fmw_12.1.3.0.0_infrastructure.jar from the V44416-01.zip file. Rename V44423_01.zip and V44420_01.zip to fmw_12.1.3.0.0_osb_Disk1_1of1.zip and fmw_12.1.3.0.0_soa_Disk1_1of1.zip respectively. You can download the required files from GitHub in a ZIP-archive using: https://github.com/biemond/biemond-orawls-vagrant-12.1.3-infra-soa/archive/master.zip or you can use Git (related tools) and clone the repository at https://github.com/biemond/biemond-orawls-vagrant-12.1.3-infra-soa.git. Note: you may want to set up an additional shared folder for use later on to exchange files between guest (VM) and host. 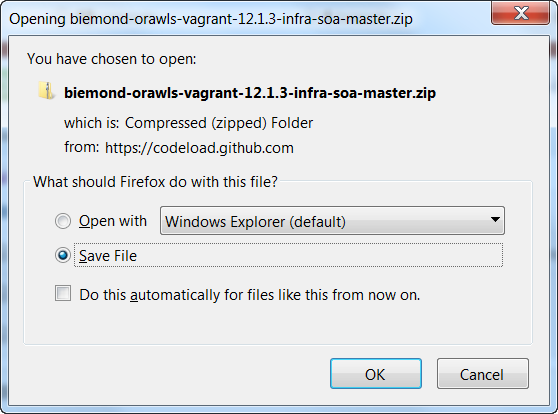 Open a command line window and navigate to the biemond-orawls-vagrant-12.1.3-infra-soa-master directory that was extracted from the GIT zip archive. 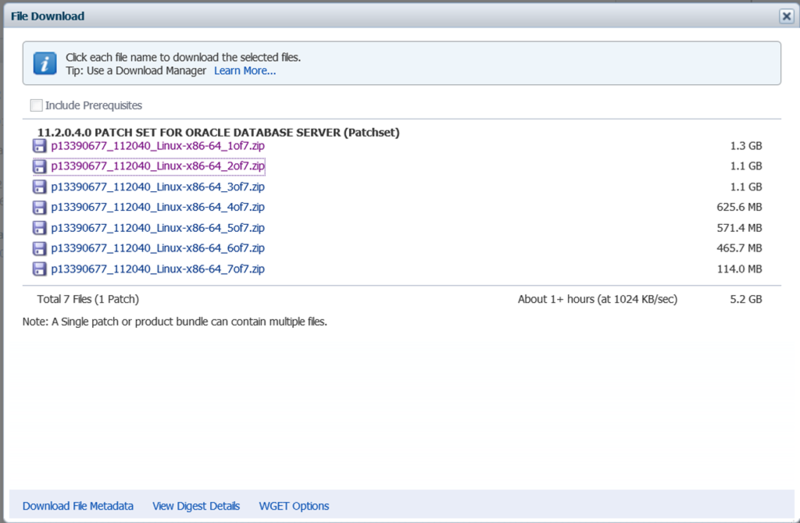 This will start the creation of the first VM – with the Oracle Database 11.2.0.4 environment. 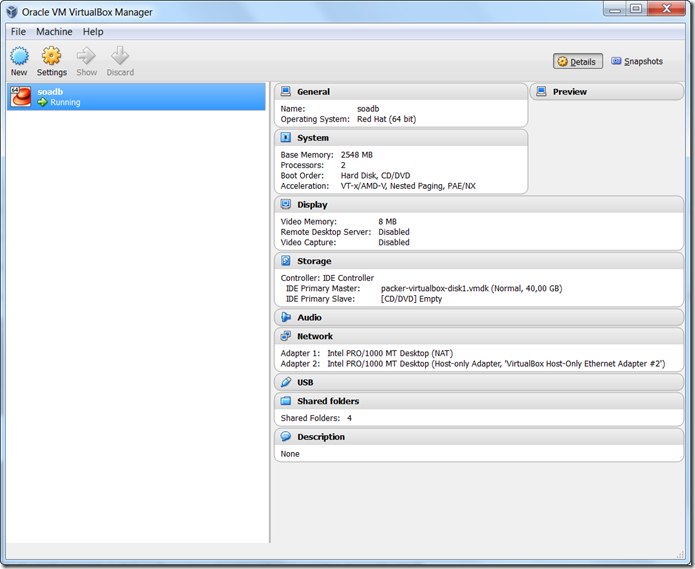 The RCU installer is executed during the creation of the second VM and then the SOA Infra database schema are created into this database. This will start the creation of the second VM. 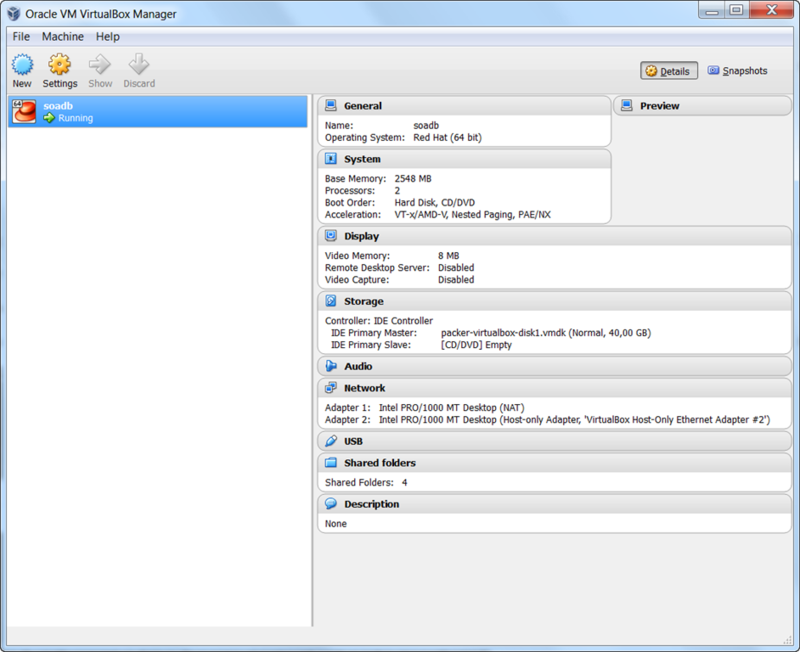 after 15 minutes and a bit, the second VM is created as well. A quick test of our new environment is done from the browser. The middleware VM – soa2admin2 – runs on IP address 10.10.10.21. 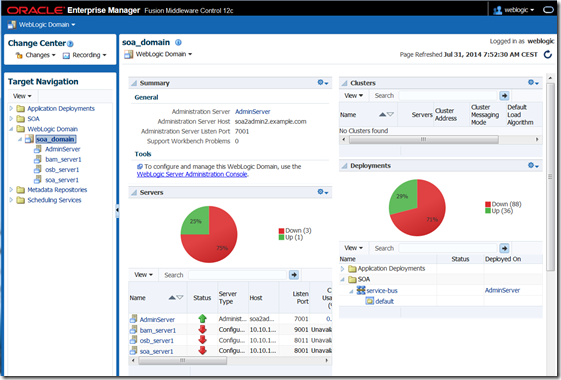 The WebLogic Admin Server is started and can be accessed through the Admin console – http://10.10.10.21:7001/console – and the Enterprise Manager FMW Control 12c: http://10.10.10.21:7001/em. 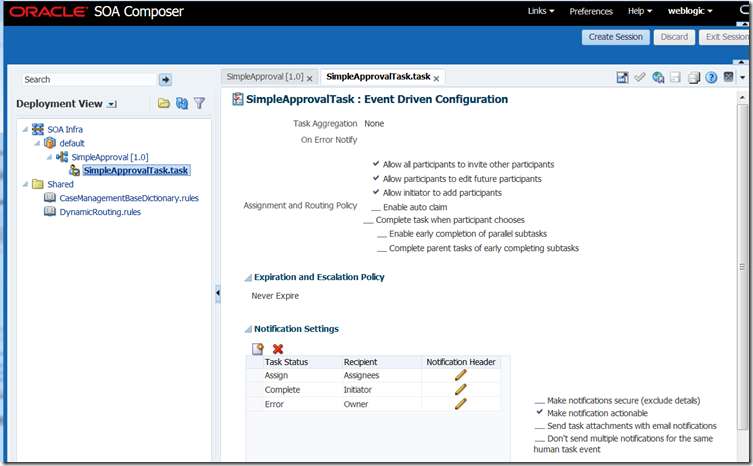 Note that a sample composite is pre-installed: SimpleApproval. 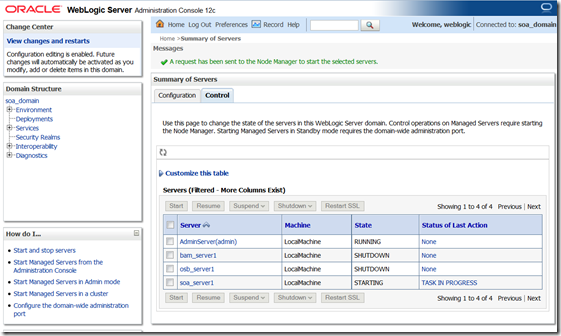 The Service Bus Console can be accessed at: http://10.10.10.21:7001/servicebus. Once the BAM Server (bam_server1) has been started, it listens at port 9001. 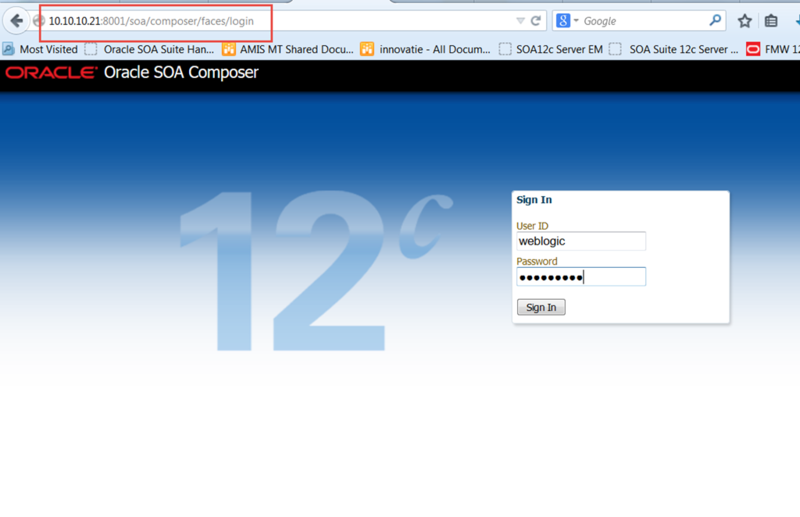 The BAM Composer runs at http://10.10.10.21:9001/bam/composer; login as weblogic/weblogic1. Note: there is at present a problem with the BAM Data Source that causes the login to the BAM Composer to fail. This problem can be resolved manually: Locate the BamDataSource under Services/Data Sources. Edit the Data Source: open the Transaction tab and enable the option Emulate Two-Phase Commit. Restart the BAM Server to have this change resolve the login issue. Exactly the same issues exists for the following Data Sources:wlsbjmsrpDataSource (which prevents Message Reports from being created in Service Bus), EDNDataSource, SOADataSource and OraSDPMDataSource. 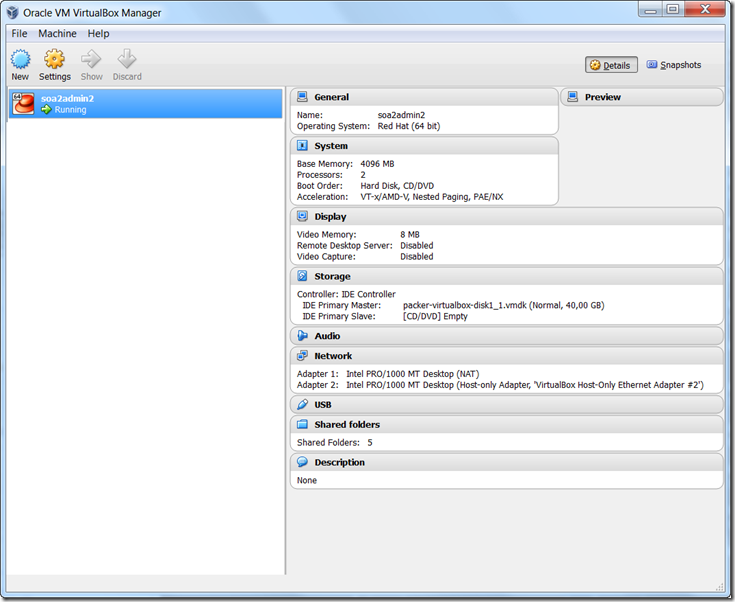 The database VM (soadb) runs on IP address 10.10.10.5. It hosts an Oracle Database ,Release 11.2.0.4.
you will stop both machines. you will stop the specified VM. 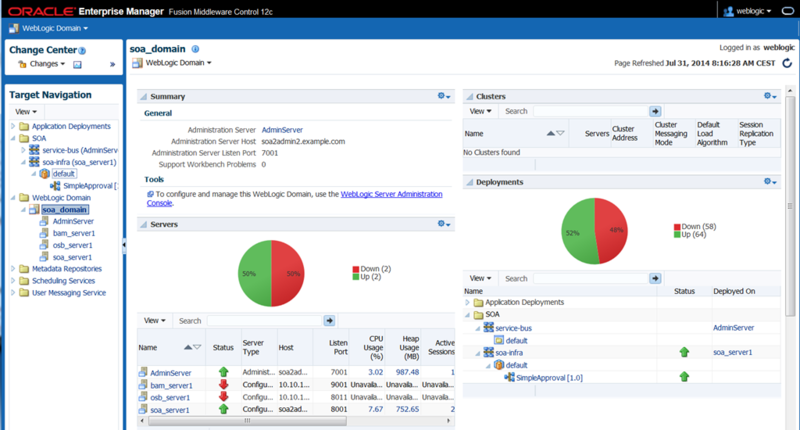 With vagrant up you can start both machines, with vagrant up soa2admin2 or vagrant up soadb you will again start one of the VMs. Once the soa2admin2 machine is running, you can connect to it, either using vagrant ssh (which will start your locally installed ssh tool in the proper context) or using Putty. In the latter case, connect to 127.0.0.1 and port 2222 – which is forwarded to the VM s0a2admin2. Login as vagrant with password vagrant. 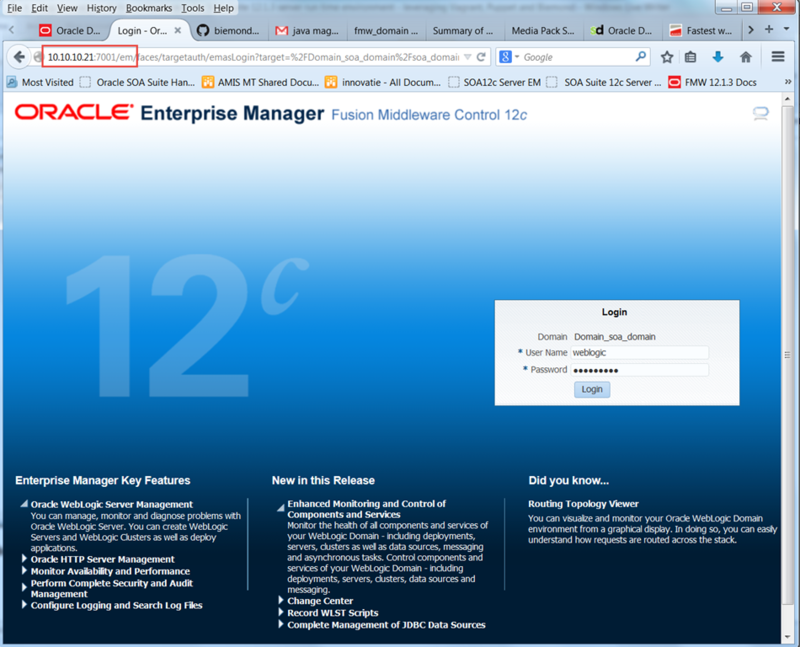 To assume the role of user oracle. To work with this splendid environment, it is useful to have connections in JDeveloper to the Application Server and the MDS Service. 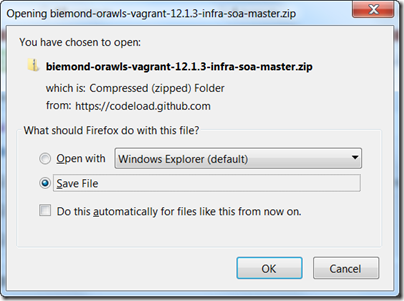 As always – big kudos to Edwin Biemond for sharing his Vagrant & Puppet configuration with the community. 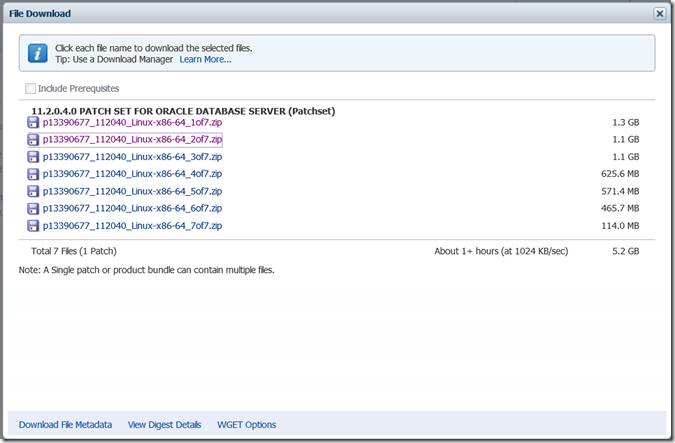 Once all downloads are done, you can create the VMs with a complete running SOA Suite 12c environment within 30 minutes waiting time (and with less than one minute of your personal time. Impressive! Thanks. 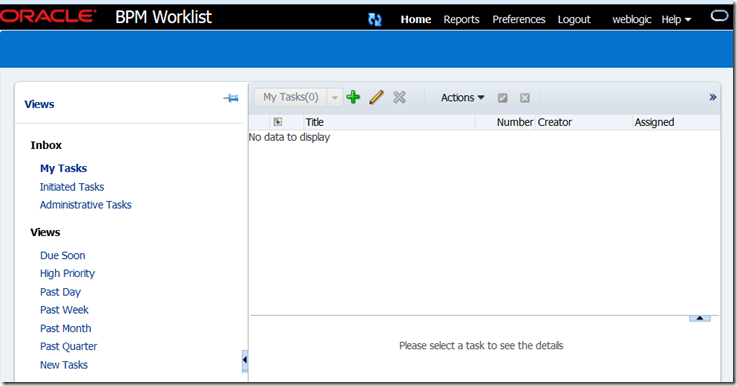 12.2.1 – soadb and soa2admin2 worked fine. When I look at the managed servers, I can see they are clustered. SoaServer1, BamServer1 and OsbServer1 running mn machine 10.10.10.21 where as SoaServer2, BamServer2 and OsbServer2 are configured to run on 10.10.10.22. I can’t see 10.10.10.22 configured. Is that right? Do we need to create a new machine? 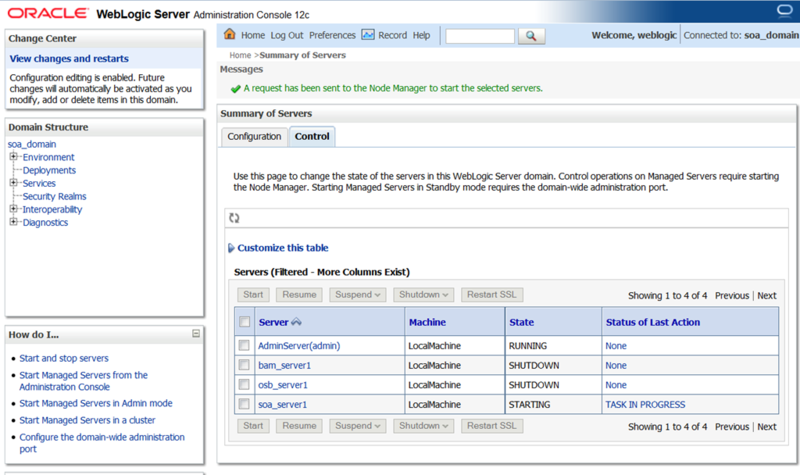 Next I tried “vagrant up mft1admin”. This failed. It looks like it’s looking for “fmw_12.1.3.0.0_infrastructure.jar” which is the previous version. I only had the fmw_12.2.1.0.0_infrastructure.jar. Also it’s looking for this file – “fmw_12.1.3.0.0_mft_Disk1_1of1.zip”. How can I change the configuration file to use 12.2.1? 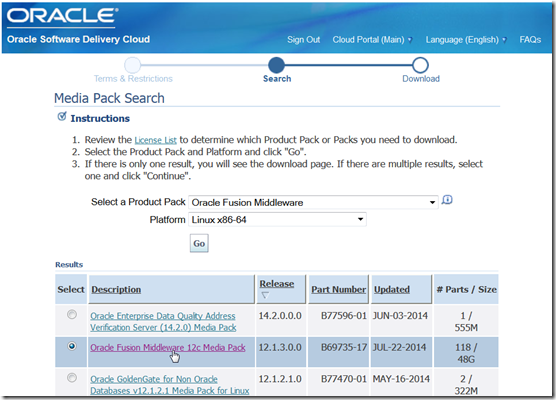 “fmw_12.1.3.0.0_mft_Disk1_1of1.zip” – Do I need to download this file from edelivery? Please give some more info. 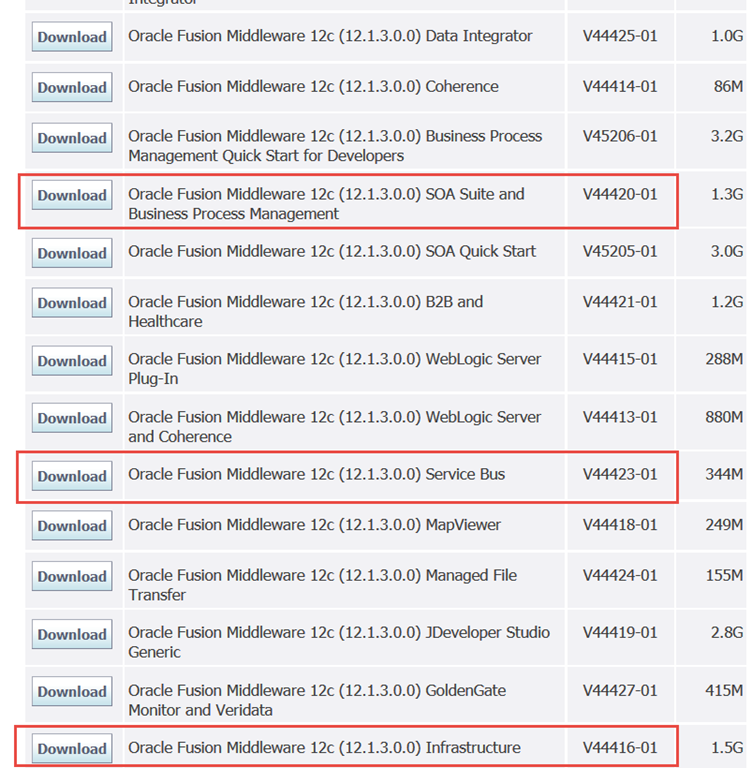 Also I ama looking to install “Oracle Real-Time Integration Business Insight Download”. Just wanted to see how does it work. 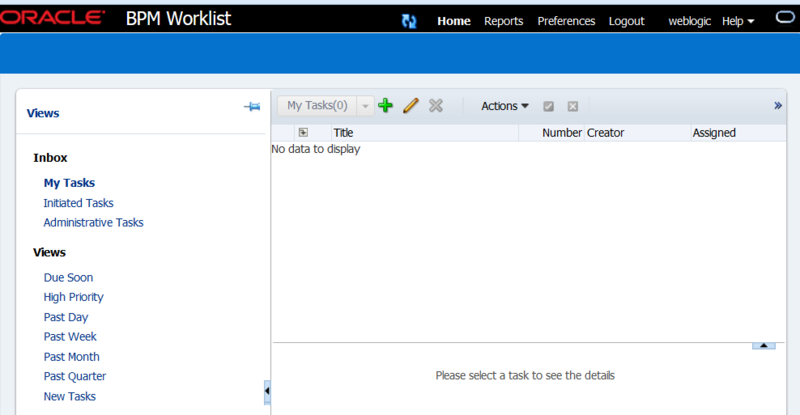 Any idea how can I install this in soa2admin2? Edwin’s current scripts (when downloading https://github.com/biemond/biemond-orawls-vagrant-12.1.3-infra-soa/archive/master.zip) also require p20423408_121300_Generic.zip which can be obtained from http://support.oracle.com. Thank you Lucas for a fantastic article. I was able to provision both 2 VMs successfully, but i have problem accessing the console (http://10.10.10.21:7001/console). It is to do with the host machine not able to get to the vm. 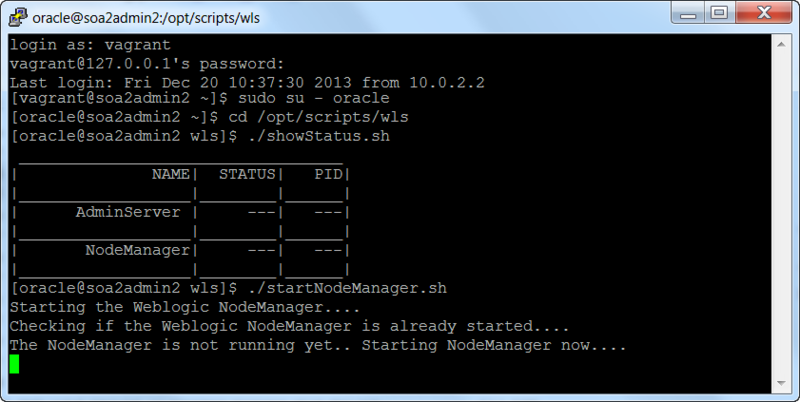 I have put the entry in my host file and i’m able to ssh into the box. Not sure if i need to setup the vm port forward setting for 7001 to get it to work. I downloaded & installed jdeveloper 12c (mac os) and I seems the creation of soa/osb applications is not possible out of the box. The service bus application is missing in the gallery. A ‘check for updates’ in jdeveloper didn’t help. Is it really necessary to install the soasuite 12c developer quickstart edition to get a jdeveloper 12c version with osb/soa functionalities ? Thanks a lot for the article Lucas and a bigHug for Edwin for his “WebLogic 12.1.3 SOA & Database 12.1.0.1 on 1 VM” repository on GitHub. I’m up and running on 1 VM. How do I ssh to the database vm? Very nice. Both VMs are cranking. Super fast too. 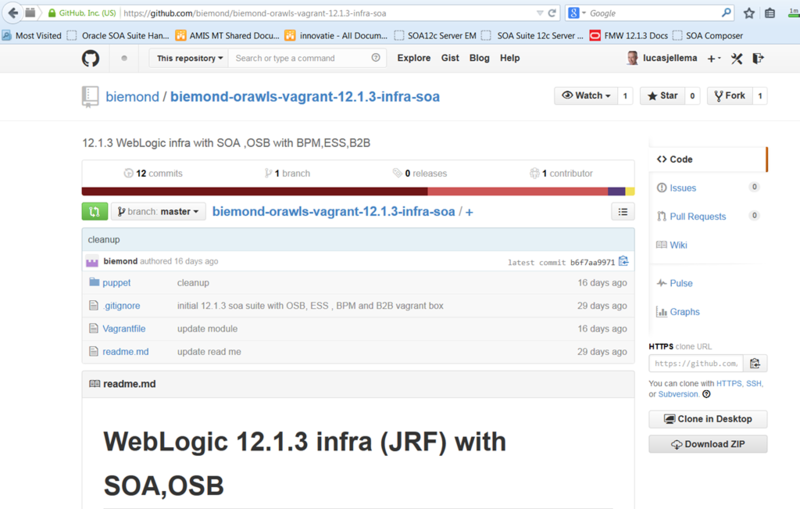 Don’t know what is the difference but a SOA 12c VM that I built ground up runs nowhere as fast. p13390677_112040_LINUX_1(2)of7.zip is aber no go for normal people. I found linuxamd64_12102_database_Xof2 but I cannot meke the soadb: dependencies error. libXext.i686 and libXtst.i686 should now have x86_64 as extension instead of i686. Can you be more specific on “You can change this in de os class of the db manifest class”: which class/jar. what abaut using the XE DB from Oracle? I am trying to create a virtual machine with your scripts to soa suite 12c, I tried to modify the scripts because I need to have installed the database and the servers on a single virtual machine but I have not got me, You Might indicate some way to realize it. I hope your answer, thanks. I will make a new box with db 12.1 and a simple soa 12.1.3 domain and inform you about the url. Thank you very much for your help, everything works perfectly! This version installed and started. However, I cannot find the database. There is only the middleware on the VM created. thank you so much for your work and this blog. I only changed JDK to actual Version (7u71) without any problem. VM with DB und SOA Suite is running perfect. I tried several times creating soadb VM, but fails with the following, am I doing any thing wring? 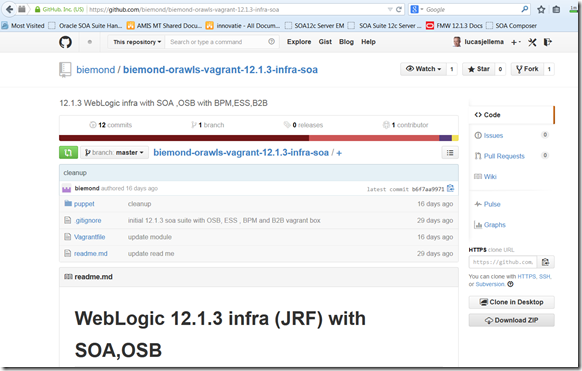 BPM/SOA 12c is in place but what for JDeveloper 12 BPM/SOA plugin ? 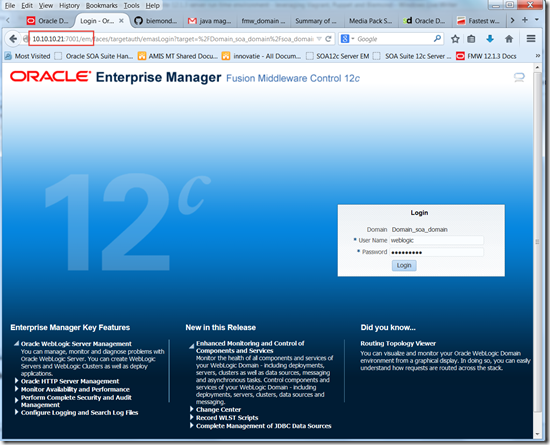 For 12c there is no longer a plugin for JDeveloper to do development on SOA Suite/BPM Suite. 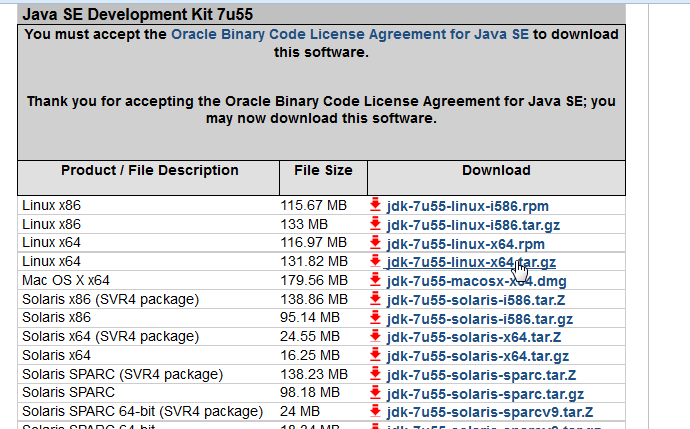 Instead, you download and install the JDeveloper 12.1.3 Studio edition that contains the design time for SOA Suite and BPM Suite out of the box: http://www.oracle.com/technetwork/middleware/soasuite/downloads/index.html – see text: “Note: The generic SOA Suite Quick Start Installer for developers is used on all platforms. 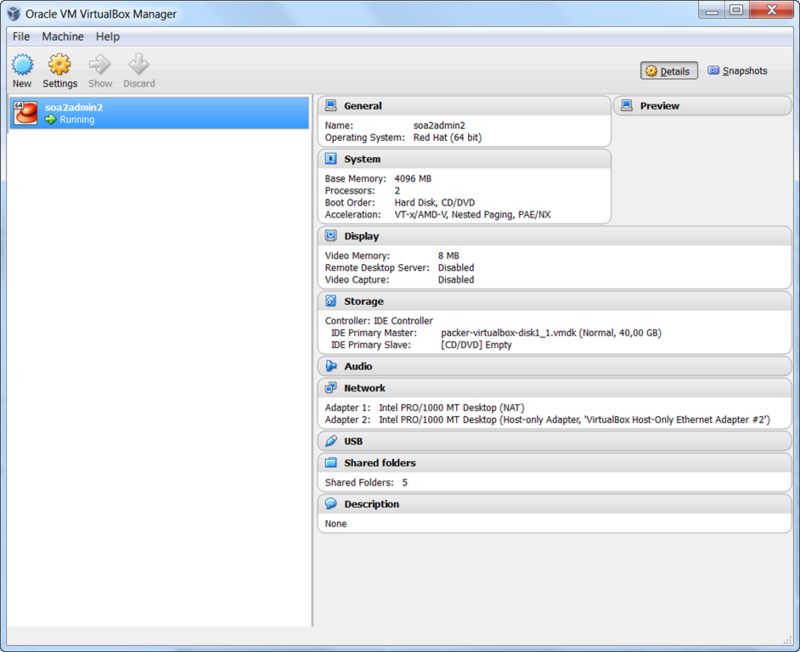 It allows you to quickly install a development or evaluation environment on a single host computer. 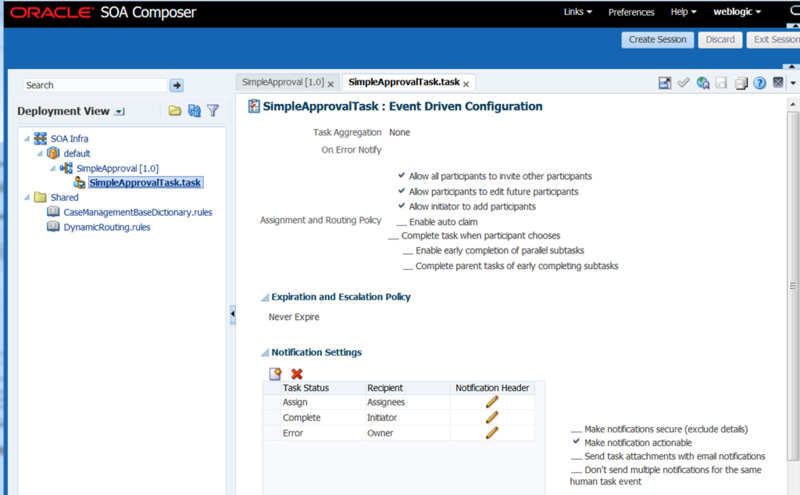 It includes Oracle BPEL Process Manager, Oracle Human Workflow, Oracle Business Rules, Oracle Mediator, Oracle Service Bus, Technology Adapters Oracle Enterprise Scheduler, SOA Spring Component, Enterprise Manager Fusion Middleware Control, Oracle JDeveloper with SOA IDE extensions and an integrated WebLogic Server and Java DB.”. u55-linux-x64.tar.gz]: Could not evaluate: Could not retrieve information from environment production source(s) file:/software/jdk-7u55-linux-x64.tar.gz. Second one very easy to miss. I eneded up repeating the install few times before I realized that I was missing the second file. 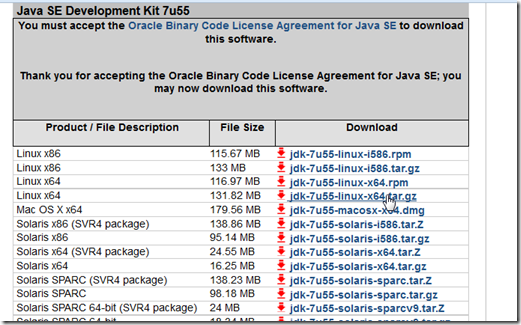 The download instructions are there just after the jdk download. The link worked from home. In the office it was probably blocked by the office proxy / network. 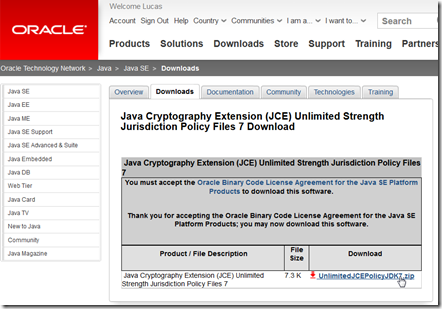 I did miss a step about downloading UnlimitedJCEPolicyJDK7.zip and ended up trying to install few times with failures before I realized my mistake. Once that was done, everything wroked fine. Both the VM’s installed successfully and were up and running. 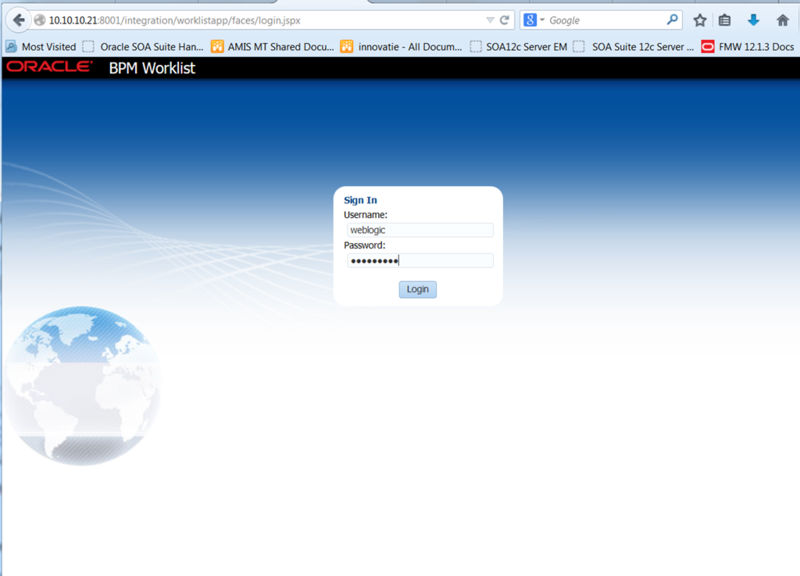 I could login to the the OEM / Console / started SOA server etc. When I connect through putty to 127.0.0.1 port 2222 then it gets forwarded to soadb not s0a2admin2. How do I connect to s0a2admin2? Got that. To connect to soa2admin2 I need to connect on port 2200. I started the soadb first so it’s on port 2222. Note: I restarted my laptop. 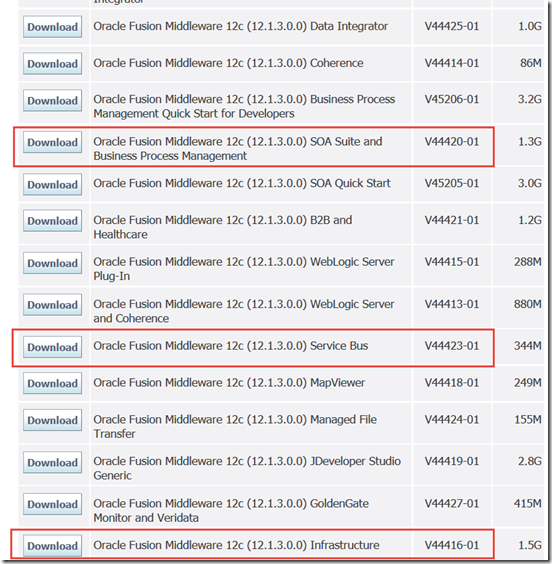 Then started Oracle VM VirtualBox Manager console, then started the soadb VM and then soa2admin2. I noticed that in the console it still shows Powered Off even though the VM’s started. I am seeing that same behavior – so to that extent it is normal. If you would not halt the VMs but instead suspend & resume them, you would not have to restart the node manaher and admin server. Thanks for the suspend and resume tip. I found another thing while trying to install it on another laptop, it may help someone following your article. If the usename has space in between then somehow it doesnt work. On the second laptop my username is “Rakesh Kumar”. My home directory becomes “C:\Users\Rakesh Kumar”. “.vagrant.d” and “VirtualBox VMs” folders will be created under the home directory during the install. Some of the steps during the install failed and the VMs did not start properly. I am not sure if it was due to the Virtual Box folder or Vagrant folder under the home folder which has space in between. I changed the default location of both VirtualBox and Vagrant folders to “C:\SOAVBox” (new folder created). The folders and files were created in this directory and everything worked fine. Thanks Rakesh for sharing these experiences. It may be the case that the access to this url is blocked from the proxy in our office. I will try it again from home. Thanks a lot for the article Lucas. I am trying to do the install by following everything on this article. I cant access this from browser as well. Strange, the link is working for me and is located at my dropbox. Does it work for the database ( vagrant up soadb) . That would be nice indeed! Well, maybe in the near future. I am already pretty happy with the whole automation once the downloads are complete. This is the py template of the domain, where you can see, I assigned 1.5gb max mem to almost all the servers.